Bash is back! Maybe you remember when I reviewed the first book of this series by Burton Cole. Ray visits Bash once again in this book. However, this time they have all kinds of fun winter escapades such as putting a pig in ice skates, sledding off the top of the chicken coop, and more. In the meantime, the boys learn valuable lessons about the fruit of the Spirit. 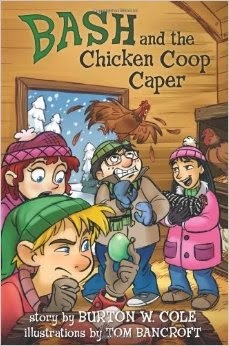 Bash and the Chicken Coop Caper just begs to be read aloud! I read it to my students and they absolutely loved it. The common consensus was that it was even better than the first one. (I read the first one to them last year, and since I have 3rd and 4th graders, the 4th graders remember it.) They laughed through the adventures. They asked if there is a 3rd book in the series. This book drew in even my hesitant readers. They loved the creative illustrations by Tom Bancroft and begged for me to keep reading at the end of each chapter. Burton Cole writes stories (perhaps slightly embellished) from his childhood in a clear way that makes the reader feel as though they are experiencing them firsthand. If you are looking for a fun book for that next chilly afternoon, maybe this is the one for you! **** I received a copy of this book in exchange for an honest review. I was not compensated in any other way.